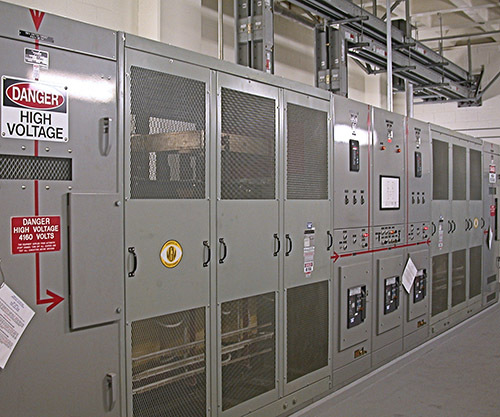 This is an example of a redundant design incorporating a double-ended unit substation with automated tie breaker controls. There are two sources that feed two loads but there is the added redundancy with the addition of a PLC-controlled automated tie breaker controller. This PLC control system is free-standing but includes reporting capability to a SCADA monitoring system, which provides visibility to the entire electrical distribution system at this data-communications facility. The loads are transmitted through the use of bus duct. We provide the engineering for the routing design and layout and the manufacturing layout drawings to the vendor as well as the coordination of the connections into the switchboards. Our customers have found that the systems that we provide have a much higher level of coordination due to the multiply facets that we are prepared to bring to our projects.